Frederick Matthias Alexander was an actor in Shakespearean plays in the late 19th century. He began losing his voice during performances but doctors were unable to find a physical cause for the problem. So, Alexander took it upon himself to find a solution to the problem. Alexander began observing himself in multiple mirrors and discovered a shift in his posture before each speech. Through practice and experimentation he was able to modify his movements and stature and, ultimately, resolved his voice problem. After his own voice issues were resolved, Alexander began to notice a similar posture in others. He believed his technique could help more people. He refined his technique and began teaching it to others. Eventually, he began to teach trainers how to share the technique with others. Alexander continued his training until his death in 1955. What is Alexander Technique Training? Alexander Technique trainers help their students recognize poor postural habits and correct them. Specifically, students are able to recognize their body’s physical reaction to the stresses of everyday life. Individuals develop these physical movements, tensions and postures out of habit. These movements and positions can damage their body and lead to aches and pains. Through Alexander Technique training, individuals are taught to retrain their bodies with a physical response that is more appropriate. Our individual postures are the result of habits we’ve developed over time. These postures can change as our habits change. One example of this is how we position our head when looking at our cell phones. Dr. Kenneth Hansraj’s study attempted to understand the impact our cell phones were having on our posture and spine. 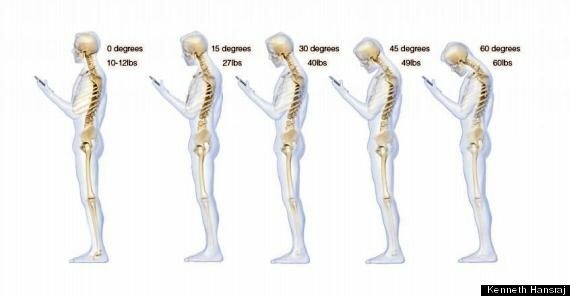 His results (shown in the diagram below) showed the significant pressure put onto our cervical spine by the habit of bending over to look at our cell phones. Through Alexander Technique training we can attempt to recognize these bad habits and correct them. 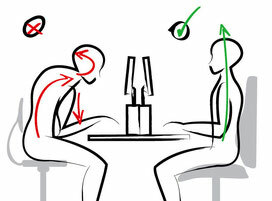 The result is improve posture, reduced stress on the spine, less pain and an improved quality of life.